Prairie Moon was entered in the 2x2xU exhibit sponsored by New Bohemia. The show was in the neighborhood of 3rd Street and 10th Avenue SE in Cedar Rapids, Iowa. Works were hung on area buildings and fences and were on display between July 2nd and October 9, 2004. 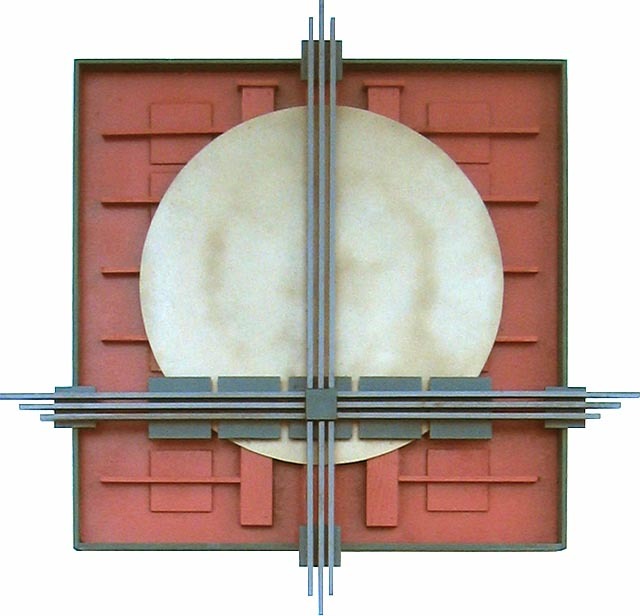 Artists bought a 2'x2' piece of plywood and created their artwork within those limits. Entries were submitted on July 1 and all 45 of them were installed the next day for the grand opening. Most entries were paintings or other two dimensional art but a few were more sculptural like Prairie Moon. I only had about 3 days to prepare Prairie Moon. I saw an article in the Cedar Rapids Gazette announcing the show and I called the coordinator, Blair Gauntt, to see if there was still time to submit something. There was, but only just. I went out assembling materials and buying paint and finished it up just as the deadline came due. The name Prairie Moon was suggested to me by my wife, Karen and it seemed to work perfectly. I had started another sculpture made out of steel a few weeks earlier but because of complexities of construction it wasn't completed by the time I started this one. I used the inspiration of the first sculpture to help me on this one. 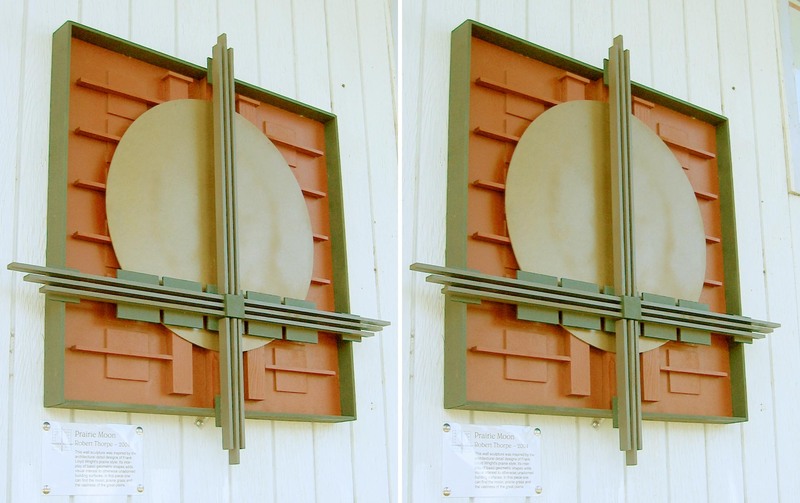 Both are influenced by Frank Lloyd Wright's architectural detail designs in his prairie style. 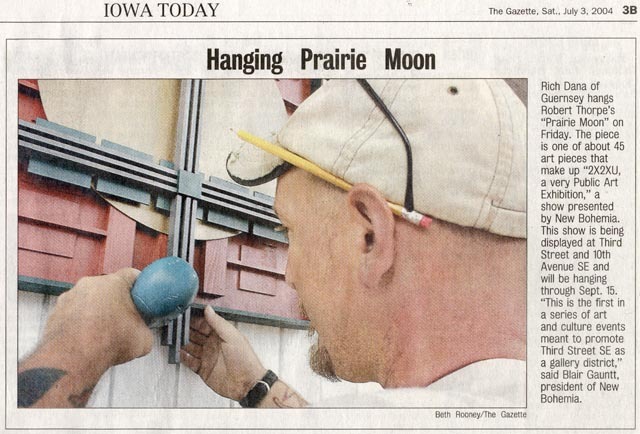 The observer can find the moon, prairie grass and the expanse of the great plains in the piece. The day after the opening Karen was looking through the morning paper and shouted out that my work was featured in a photo. That picture is copied below. Sorry about the color, it was an overcast day when I took these and I had to fiddle the color balance. 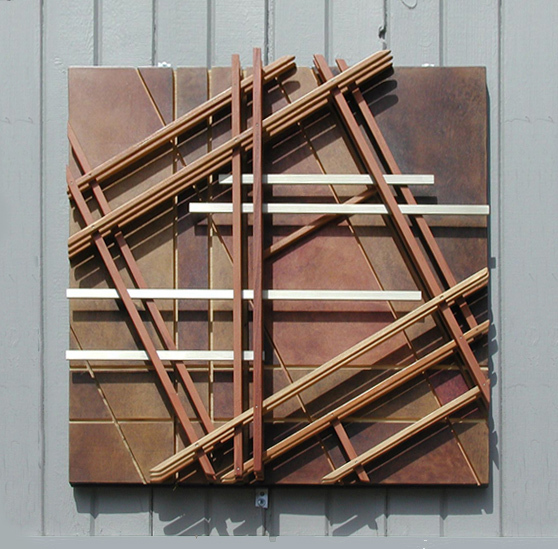 After the show closed in October, I traded Prairie Moon to John Schwartzkopf for his piece, Broken Field Gridwork.